Ever since we had our first baby, I had my eye on the MOST ADORABLE line of animal rockers I’ve ever seen. They are by a company called Rockabye and you’ve probably seen them before. If not, you’re going to definitely want one for your child’s nursery! 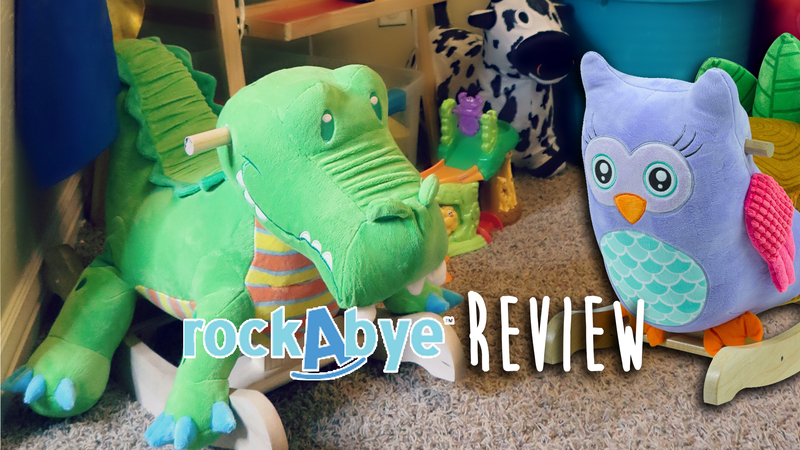 I was so excited to get the opportunity to work with Rockabye and we received two fun rockers to test out for our kids. The Rockabye rockers have soft, cushy seats, wooden handles, and a high quality wooden base. Some of even play music! On the inside of the Premium Play and Rock rockers, there are embroidered shape buttons that play a selection of fun songs for kids to teach them about ABCs, Counting, Colors, and More. You can also choose a Classic rocker. Our kids sure loved playing with them in their playroom and in the nursery! No details go unnoticed with these rockers as they feature high quality design that is visually appealing and perfect for little ones to learn and play for a long time. They come already assembled in the box so you can take them out and play right away! While they are designed for younger kids starting around 9 months old, they can accommodate up to 80 pounds! This a great investment to pass down to each child in your family as they really do hold up quite well! Here are some photos my friend, Lesli, took when her sweet twins came over for a play date! If you’d like to see the rockers in action, be sure to watch the videos at the end of this post! Rockabye rockers are available in a few baby boutiques and you can also purchase directly from their website or even order on Amazon. Be sure to head to their website first to browse their selection so you can see all the fun options available. If you’re like me, you’ll probably want more than one!